Pleased be informed that effective 21th Sept 2018 , orders with SAME INSTALLATION ADDRESS will NOT entitle for COMMISSION and there will be NO penalty charges imposed. a. Same installation address, same ID, installation of new line and termination of existing line. b. Same installation address, different ID, installation of new line and termination of existing line. Please be informed that effective 19th March 2018 onwards, new customers who subscribe to UniFi and pre-UniFi (Streamyx) packages (Consumer & Business) will be subject to a penalty fee of the remaining months should the service be terminated within the contract period. This is applicable to order processed into TM system from 19th March 2018 onwards. Customer will be charged remaining internet monthly fee (internet monthly fee is calculated based on original price before discount) for early termination within the contract period. You are required to inform customer on this new early termination policy from TM before closing deal. Important Notes: Early Termination Penalty Fees will be charged based on the original package price x remaining month period within contract. In accordance with the new Companies Act 2016, SSM has issued new documentation to replace the existing SSM documentation under the former Companies Act 1965, starting from 31 January 2017. Effective 16th June 2017, TM has new policy on SSM document for Unifi and Streamyx order. All new Unifi and Streamyx orders from business customers are required to submit the original copy of the new SSM documentation together with the “Certified True Copy” (CTC) as a supporting document. In addition, please be informed that all CTC documents will have a validity period of one (1) year only. Pertaining to the matter above, E-form and Biometric Device (Electronic Thumbprint Device) will be implemented by TM for Unifi and Streamyx registration. This policy will be 100% fully implemented in Tagter.com for orders registered in TM system effective 1st November 2016. You may submit order as usual. We have runner to contact your customer and arrange appointment to get thumbprint verification from customer before we process the order. RM50 will be deducted from your commission to pay the runner, except Melaka (RM30). Order will not be processed if runner failed to get thumbprint verification from customer (For example : Customer refuse to do thumbprint verification). Kindly inform customer about thumbprint verification before hand to ease the registration process. For foreigner orders, you yourself (Not Foreign Customer) are advised to come to our office to do thumbprint verification as agent and witness. If you are not convenient to do so, your foreigner orders will be rejected. We are sorry to inform that our runners are not able to cover all areas in Malaysia. Areas available for runner to do thumbprint verification are listed below. For orders fall out of the area listed, we have no other choices but to reject the order. Sorry for any inconvenience caused. Good News!!! Unifi PRO and Biz PRO 100Mbps is now launched! April 1st 2016 to 30th June 2016! Kindly disseminate this information to all relevant staff for the necessary actions and implementation. The introductory price promotion of UNIFI ADVANCE & UNIFI BIZ ADVANCE that was introduced on 15th October 2015 will end on 31st March 2016. Please take this opportunity to continue to get more sales before the promotion ends. 1. Backlog orders prior of 31st March 2016 could be processed until 14th April 2016. 2. All collaterals with regards to this campaign shall be withdrawn immediately on the 31st March 2016. New collaterals of next campaign will be distributed. 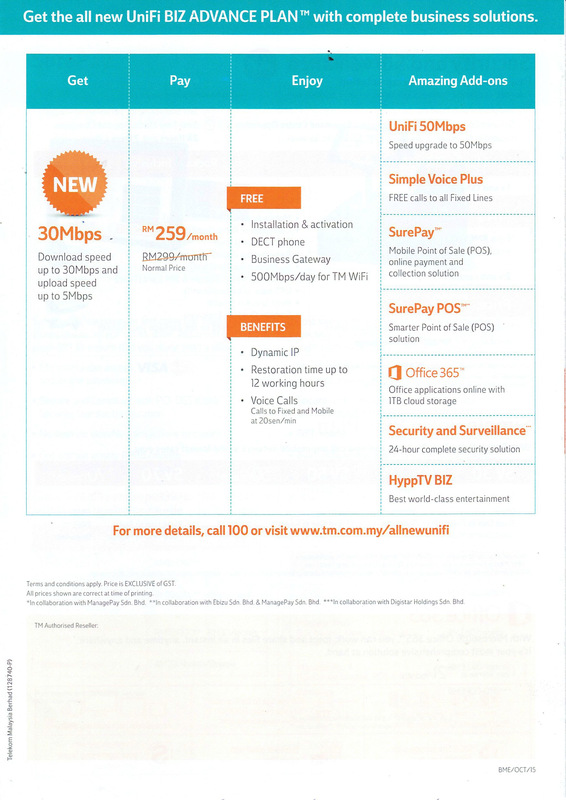 Please be informed that, the new Unifi (Advance Plan & BIZ Advance Plan) now is available nationwide. You may now promote these package with a special introduction price effective on 15th of October 2015 to 31st of December 2015. 5) Price shown is exclusive of 6% GST. 6) Commission is based on RM149 X 130%. 1) DECT phone & Business Gateway is applicable to new installation only. 3) Termination before the end of the contract period will lead to a penalty of RM500. 4) Price shown is exclusive of 6% GST. 5) Commission is based on RM259 X 130%. VIP 5/10/20 & BIZ 5/10/20 will no longer be offered starting 15th October 2015. Please clear all the backlog by 31st October 2015.
enjoy speed up to 30Mbps and HyppTV premium channels in any of these packs! Business customers will experience a complete business solution with new UniFi BIZ ADVANCE PLAN™. Enjoy RM40 discount for 24 months, worth of RM960 savings! 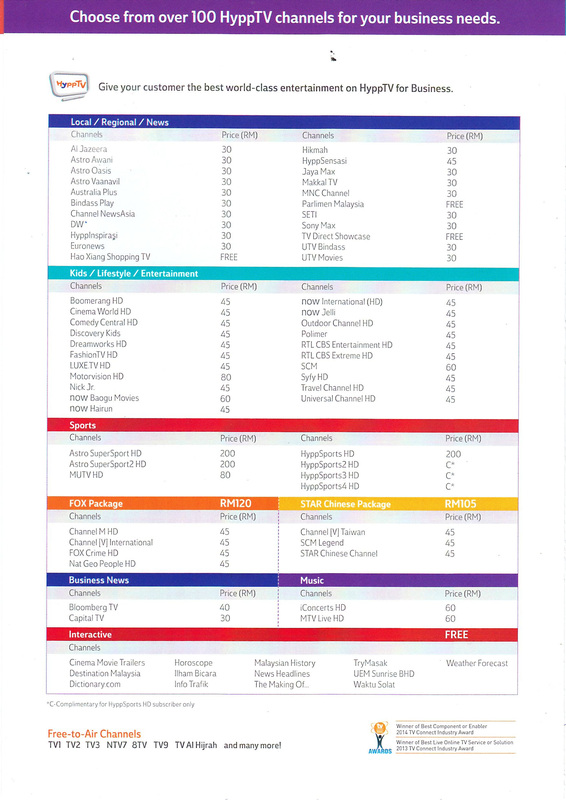 Kindly be informed that the following Streamyx packages are withdrawn from the market EFFECTIVE IMMEDIATELY. Hence, all collateral related to these packages need to be removed instantaneously. Existing customers who are subscribing to these packages will not be impacted by this exercise and will continue enjoying the service as usual. There are also no changes to the customer bill. Partners must provide CUSTOMER'S valid and reachable email address during order submission. Kindly be informed that effective 1 April 2015, Registration (Application) for YES 4G and Celcom Broadband which involve Activation Fee, Plan Advance Payment, Device Upfront Payment, Monthly (Commitment) Fee, Device Price are subject to GST at standard rate 6%. Foreigner security deposit is not subject to GST.